A great experience as usual. Very informative and friendly! Dr. Howell and her staff are wonderful. We are looking forward to our orthodontic journey with them!! From the kind and helpful staff, to the time spent with Dr. Howell, to the pristine facility, our experience was unmatched by any other office visit we've ever had. We couldn't have been happier and actually look forward to visiting their office again! Gorgeous facility, honest professional opinion for my daughter's braces, actually recommended we wait 7 months! I absolutely love that Dr. Howell doesn’t rush the process and wants patients to be fully committed on their part with caring for their teeth before getting braces. She does a great job of stressing the importance of dental health. Dr.Howell and her staff are exceptional people. They make you feel right at home. Dr. Howell pays attention to the smallest details in your treatment, which is reassuring. I would recommend this office to anyone looking for a great experience. I can trust Howell Orthodontics to give honest and accurate information while providing the highest quality of care to my family. We had a wonderful visit. I am very impressed with Dr. Howell's knowledge and concern for my children's teeth. The office staff is warm and welcoming and the system for new patients is very well thought out and organized. More than I expected... The staff Dr. Howell has is precious and you can tell they enjoy their jobs and environment. It is felt by their customer service and willingness to spend time with each patient. I appreciate that they talk to and involve the kids. I will definitely be recommending!!! The entire experience was phenomenal! Wouldn't change a thing! Great Office! From every staff member to the treatment team, everyone is so caring and helpful! Everyone was so welcoming and kind. Dr. Howell took her time to explain everything and answer questions, which is really important. We are glad we were referred here by our dentist. Thank you for another great visit to your practice! The level of friendliness and professionalism is outstanding. We look forward to our next appointment. The staff and Dr. Howell do a great job, not just with the procedures but with customer service. It's a great office, other businesses would benefit from watching and learning from these folks! Everyone is so nice and helpful. The office is so comfortable. We enjoy every visit with this team. They are friendly and professional. They explain everything so well. They also explain at every visit how the patient is doing and also what is expected before the next visit. When we leave their office, we all have had a wonderful experience and look forward to the next. Fabulous! Loved Dr. Howell and all her staff. They were very friendly and very welcoming. I like her conservative approach to treatment. Beautiful, clean office. The ladies in the office were super friendly and very helpful! Would definitely recommend them to everyone! All of you are wonderful, I enjoy my visits each time I go in. Thank you so much for taking care of me and giving me a confident smile again. Dr. Howell and her staff are always friendly and professional. You never feel as if you're being pushed into treatment or sold anything. Dr. Howell is wonderful in monitoring my child's teeth. She uses her expertise to prevent him from wearing braces twice. I appreciate her concern with parents not having to over spend to have their child's teeth straightened. I cannot say enough about the care and compassion that the ladies in this office show to our family! The whole office! I currently have two children who are in braces and I'm so glad I chose this office! Dr. Howell is always so kind, and makes my children feel so comfortable when she see them. She is beautiful inside and out and has a real heart for what she does! She takes care of my children like they are her own, and it makes me feel like they are getting the best orthodontic care there is! Without a doubt the best orthodontist ever! Everyone in the office is always so friendly & helpful! We are always treated with kindness and respect! We have already seen massive improvements halfway through Angel's treatment. New office is beautiful and accommodating! Truly no complaints! Everyone is pleasant and very helpful and knowledgeable. Made the experience for my granddaughter who was very nervous and informative yet pleasant visit. This was our first visit and it was a great experience. The staff was wonderful and my 7 year old son was at ease during the appointment. The office is very clean and has a good set up and flow. I was very impressed! Everyone was very pleasant and knowledgeable. Teamwork was awesome! I loved the office! No complaints at all! I would highly recommend this office! Thanks for making our visit enjoyable! Dr. Howell is an exceptional orthodontist who cares for the entire patient: mind, body, and soul. There is no one else who I would trust with our daughter's smile. There is no other orthodontist and staff who are more professional, courteous, or friendly than Dr. Howell and her staff. My children's teeth look amazing, and in a relatively short period of time! I continue to recommend Dr. Howell to all my friends! This orthodontic office is amazing. The new building is professional, beautiful, and closer to my home. The staff is always courteous, helpful, and nice. Dr. Howell is an amazing doctor. She does all she can to help you and your child be comfortable. We feel exceptionally confident that our expectations will be met! Personally, I've never been in a medical facility that catered to the patient, parents, and community as wonderful as yours. We love Dr. Howell and the staff at Howell Orthodontics! Dr. Howell gave us a free consultation when my daughter was very young and followed her until she was ready for an orthodontic appliance, without charging us a penny! Once she was ready for her orthodontic appliance, they quoted us a reasonable amount, which covered all expenses, and then continued to follow her until the appliance had done its job. While my daughter may still need some minor orthodontic work, because of Dr. Howell's expertise and preventive orthodontic care, she may not even have to have braces! Their office is organized and timely. They send us email and text reminders, which we signed up for, and always get us in and out in a time effective manner. We cannot say enough good things about their positive, caring orthodontic care!! Dr. Howell is the best! I am so glad I chose to see Dr. Howell. The staff was friendly and made us feel welcomed. Dr. Howell spent time explaining the treatment my son will need. You can tell she loves what she does and she is dedicated to her patients and profession. Thank you! Dr. Howell and her staff are kind, professional, and truly care about our family! They never fail to ask about our lives and how we have been, taking a genuine care about us, not just our teeth. Add that to AMAZING orthodontics and you've got a win! After hearing numerous stories of the fantastic service and outcomes received at Howell Orthodontics and the many community events at which I have seen Dr. Howell, it is finally time for me to share my experiences. From the initial phone call to set up my son's first appointment, I was greeted warmly, had all of my questions answered, and felt completely comfortable with the experiences here. It absolutely feels like home. Every appointment has been fantastic: Thorough and detailed in the plans for orthodontic care; reward program for grades and healthy habits; community service to offset some of the cost (although already very affordable); easy payment plans; a staff that is very in tune with the community and care of adults and children. I am super excited to return on my next visit! I will finally be finished with my treatment. Being older, it is sometimes awkward to come into an office filled mostly with patients the ages of my children, but Dr. Howell and her staff always are professional and courteous, making me feel right at home. Can't wait for a few more weeks to sport the new smile! Dr. Howell is always friendly and caring. She takes her time with you; we never feel rushed. Her office is inviting. Feels like home when you are there. Have recommended several friends already. We enjoy our visits with Howell Orthodontics; everyone is friendly and warm, greeting you by name when you arrive for your appointments. Appointments run on schedule making it easy to plan your day. There are lots of perks (gift cards, drawings, etc.) and incentives for the kids to brush well, follow the rules (no chewing ice! ), which makes it fun for them and assures that parents get the results they pay for in a timely manner. We are very happy that we chose Dr. Howell and her office for our daughter's braces. Dr. Howell's office is wonderful. Not only are they the best staff, but they also participate in the community by giving back. Dr. Howell truly cares about her patients. She always explains everything very thoroughly. The entire staff is caring and compassionate. They also are involved in teaching high school students about orthodontics. It is such a breath of fresh air to be a patient of an office that cares so much about the community. Dr. Howell and staff show excellence in all aspects of orthodontics. We have been impressed from the initial visit to begin treatment, throughout the treatment process, and currently after the braces and into retainers. Thank you for giving great orthodontic care! The staff at Howell Orthodontics is friendly, efficient, and caring. The open door policy does a great job of ensuring you know what is going on with your child, and allows you to ask questions at will. The best part is Dr. Howell; she is so friendly, knowledgeable and always has a positive, happy smile on her face. She makes the practice so homey and happy. Really cares for her patients!!! Dr. Howell is a great orthodontist. She really cares for her patients and provides incentives to ensure that they do well. This is our second child to get braces and I wouldn't think of going anywhere else. From the moment I walked in the office, it was a great experience. They were prompt to get us back, but Dr. Howell took her time with my shy seven-year-old. She made her feel at ease, and me too. I would highly recommend this office to anyone. Thank you! My family has been using Howell Orthodontics for a pretty long time and can't recommend them highly enough! Five stars is too low! Dr. Howell and her entire staff are sweet, friendly, kind, and considerate of the patient's time. They have great early hours that work well with my work schedule and my children's school schedule. If you are looking for a great orthodontist, look no further! This is the place you need to use! Our family lives about 30 minutes away from Dr. Howell's office, but it doesn't matter. I would drive an hour! We went to our free consultation a few months ago because it was just that... Free. We are careful with our money and I wanted to see what our family was in for as far as treatment plans and financially. Dr. Howell and her staff are kind and personable. Honestly, I left wanting to have her braces put on that day! We waited and went to a larger practice for a second opinion. All the allure of coffee bars, iPads, and gaming systems couldn't change that we waited over an hour, felt bullied into treatment, and were completely uncomfortable with the staff. The same treatment was offered at a much higher cost. I called Dr. Howell's office and they got us in that same day so my children wouldn't miss anymore school! I highly recommend this office for their conservative but reasonable treatment plans, their help with financial plans, and overall personability with the patient and family. Hands down the best orthodontist in the area! Everyone in the office goes out of their way to make us feel welcome and valued. Your office could be a model for other businesses for superior customer service. We love Howell Orthodontics! We have been very impressed with the professional and very caring way of Dr. Howell and the whole staff. Each visit Dr. Howell explains what she did and what we should expect. I am very happy with the results of the braces, but almost as importantly, you know how much they all care about the patients there. It is so nice to have personal attention. I brought my six-year-old Kaitlyn into the office per a referral from our dentist. The office staff was so professional and courteous from the moment I phoned to make the appointment to the time we arrived and then checked out. Dr. Howell was great with Kaitlyn and then took a good amount of time to explain exactly what was going on with Kaitlyn's teeth and what to expect in the future. There wasn't any pressure or the feeling of being “sold” on a treatment. Dr. Howell actually preferred that we wait and have another evaluation in six months before making any decisions that would be costly. I have to say what a breath of fresh air and enjoyable experience. I have not received such personal medical/dental care in a very long time. You can tell that Dr. Howell and her entire staff truly care about their patients. I look forward to having Dr. Howell treat Kaitlyn and the opportunities that I will have to recommend Dr. Howell to others. Your entire staff has wonderful compassion for what they do. We would like you to know how well we appreciate your service. Keep doing what you are ALL doing! Everyone was so friendly and most helpful with the whole procedure. We all as a family are comfortable with all the procedures that are going to be performed. I would like to thank you so much for the wonderful experience. I have been so pleased and impressed with all that has taken place. Personal phone calls meant so much. There are not enough good things I can say. Thank you. Looking forward to my younger daughter working with you. 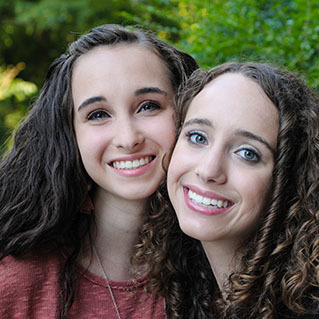 We are very pleased with our experience at Howell Orthodontics. Braces are a large investment for families. We feel that Dr. Howell's practice offers the most up-to-date technology and information for families looking to make this important decision. Dr. Howell's staff is always friendly and professional. The office offers fun incentives for patients. We couldn't be happier with our decision to use Howell Orthodontics for our children.